Taketomi is a small island 9km away from Ishigaki Island for ten minutes by high-speed boat. 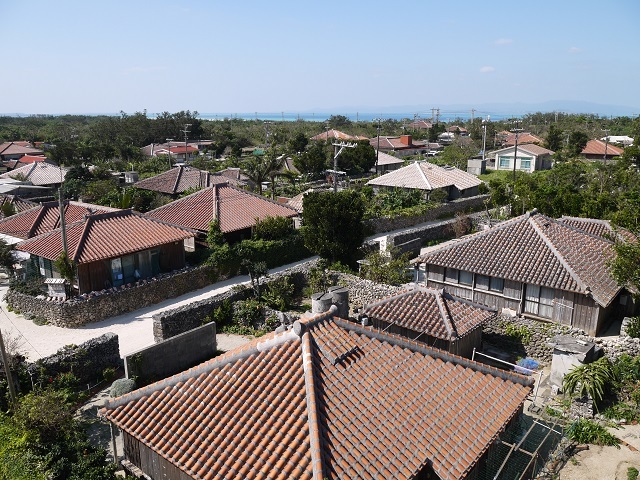 There are a village of private houses of beautiful traditional red cement tile roofs, colorful flowers along the road of pure white coral sand and buffalo cars moving the village. The beautiful and simple scenery of original Okinawa remain unchanged. The traditional cultures such as many folk songs, entertainments, traditions and customs are inherited on Taketomi Island so it is an island of the cultural heritage. It is chosen in the important preservation district made up of the national traditional buildings. It is an ideal island for those who want to live anon-daily life, forgetting time. Because it is totally flat and small, going round by rental bicycle or on foot is recommended. The modern civilization does not match Taketomi Island. The sunset view seen from west pier is popular, but the beautiful scenery seen from the pier straight towards the blue sea is more attractive at all other than dusk for people to enjoy. We were impressed by not only the sunset view but also the beauty of the star at night. The Kondoi Beach of white sand and calm wave of shallow azure blue water is really beautiful. There are tourist attractions including the Kaiji Beach where the star-shaped sand is seen and tower as the national cultural property, from which the streets of the village can be seen, but the greatest charm of this island is the time. Relaxing time spent in Okinawa heals all. Don’t you want to regain your time? 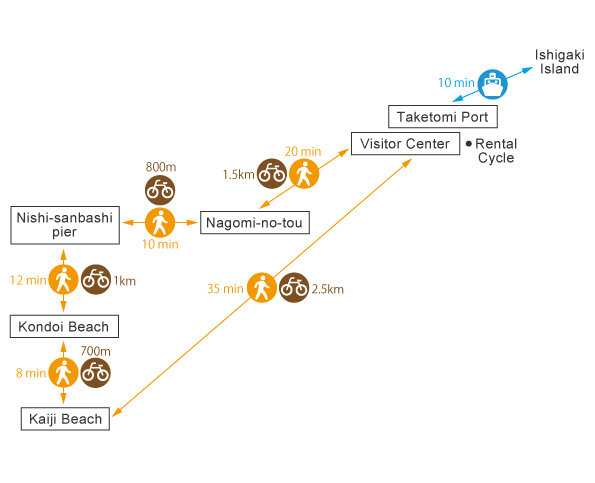 10 minutes from Ishigaki Port to Taketomi Port with 1 vessel per 30 minutes.